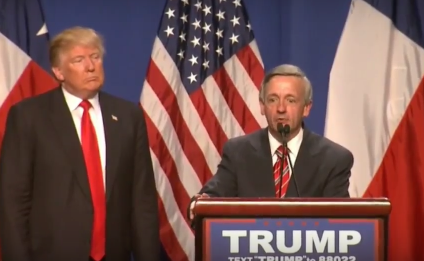 Texas megachurch pastor Robert Jeffress, who serves as a top evangelical ally to President Donald Trump, told Christian radio host Sandy Rios today that he met with Trump last week to discuss moving his judicial nominations through the Senate. Jeffress, who has declared that God has authorized Trump to go to war with North Korea, pronounced that God had intervened to make Trump president and said that Trump’s border wall and his attacks on the media are soundly based in the Bible, told Rios that he told Trump that Senate Republicans were holding up his nominations. “Listen, I want to be very clear about this, Sandy. I had the chance to talk to the president and his team last week about this bigger issue of these federal judge nominees being blocked,” Jeffress said. “He has fulfilled his commitment. He has made a record number of conservative nominations, but they are being held up, Sandy, by the conservative—by the Republican-controlled Senate Judiciary Committee,” Jeffress said. Jeffress has well-documented history of homophobic statements that include labeling gay people as either pedophiles or child abusers, claiming that the gay rights movement will welcome the Antichrist and suggesting that homosexuality will lead to the “implosion of our country.” The megachurch pastor also has a record of hostility to Muslims, Jews, Mormons and Roman Catholics.